Garlic scapes are the tender stem and flower bud found on a garlic plant. The scape grows first erect, then coil and is removed in late June to encourage the bulbs to increase in size. It has a mild garlic-flavour with a texture resembling asparagus. The scapes are the first taste of the new crop’s bounty and coincide nicely with spring and early summers bbq season; making a great substitute for regular garlic in any recipe. Scapes have a garlicky taste and are very versatile in the kitchen. Raw scapes are crunchy like green beans or asparagus with a full garlic flavour. 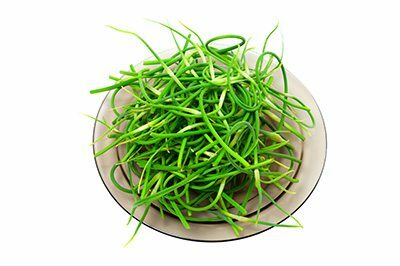 You can eat scapes raw or cooked. Just trim and discard the stringy tip of the scape. You can use garlic scapes in the same way that you would use garlic or scallions. Garnish roast or grill with the spectrum of meat and vegetable entrees. Use in place of capers or chopped scallions. Provides the tastiest cocktails swizzles anywhere. Is a hearty staple for any soup base. The garlic scapes can be refrigerated or frozen or pickled after the brine or marinade is used to perfect salsas, dressings, vinaigrettes and sauces. Pretty much anything but desserts. For recipes please visit Garlic Scape Recipes. Storage: Store scapes in the crisper in the fridge for up to two weeks. Chop and freeze in plastic baggies. Puree with oil and freeze in ice cube trays. Or create Garlic Scape Pesto which can be frozen or refrigerated for future use in a wide variety of recipes. This great article by Chatelaine details the 5 Health Reasons to Eat Garlic Scapes.